Valentines Day also happens to be the birthday of the state of Oregon. Oregon the state is 150 years old today. You can find more sesquicentennial news here. Although there are a few things I miss about California. I have never regretted moving to Portland. I love it here and the Pacific Northwest is ridiculously beautiful. I bought this postcard over 10 years ago when I was living in Mountain View, California. I wanted to be up here. I would stare at it a lot. I love the way tinted photographs look. Something about it looks almost more real to me than color photos. 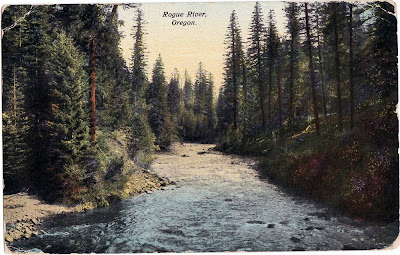 The postcard is postmarked August 1912 and is addressed to a Mrs JW Sackett, Anaheim, Cal. Mother is still improving. Will let you know if any change. Have a dandy nurse.